The articles are in the language of the original publication. A cikkek a megjelenés nyelvén közöljük. 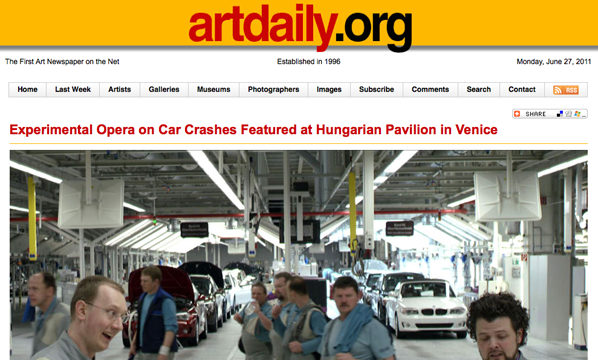 VENICE.- In autumn 2010, Műcsarnok / Kunsthalle Budapest announced a competition for curatorial commission and exhibition at the Hungarian Pavilion for 2011. The members of the jury, invited by the then national commissioner Zsolt Petrányi, were the following: Gábor Andrási (art historian, editor-in-chief of the journal Műértő), Géza Boros (art historian, deputy head of department at the Ministry of National Resources, Department of Arts), Dóra Hegyi (art historian, project leader of tranzit.hu), Edit Sasvári (art historian, vice director of the Museum Kiscell / Municipal Picture Gallery), Katalin Timár (curator of Ludwig Museum – Museum of Contemporary Art, curator of the Hungarian Pavilion in 2007) and Krisztina Szipőcs (art historian, head of the Collection Department at Ludwig Museum – Museum of Contemporary Art, editor of the journal Balkon). The skeleton of the work is an experimental opera that takes place on the stage of life, relating, and reflecting on, the stories of car crashes in a dialogical form: the critical moment slowed down by memory and related in utmost detail; the drive and the course of events leading up to that moment; as well as the complex relation of man to driving, in view of his inclination to fetishize his technical objects. Filling the space as an acoustic experience, the piece is also presented at the show in the form of a musical film. Hajnal Németh’s complex installation of multiple components treats the halls of the Hungarian Pavilion as acoustic units: music fills each space synchronously yet with slight differences. Walking around the exhibition halls, the visitor is free to discover the various layers of sound and meaning, the lyrics, the music, as well as the ambient noises in the presented video. On the one hand, the installation is bombastic and theatrical; on the other, it displays subtle and philosophical design. The totalled wreck of a car is flooded in red light against the sonic backdrop of a musical composition that evokes associations of improvisational, experimental opera, its libretto based on interviews with survivors of car crashes. Hajnal Németh is serious and intellectual, but she wraps this in the façade of mass culture. Her work can be related with existentialist literature as well as the phenomena of Eastern European “new pop”. Nevertheless, no sooner do we hypothetically imagine such an analysis than it is short-circuited by the amplified warning of a colour, shape or sound in this context. The aesthetic of her unique work lies in this individual-existentialist sensitivity, which, owing to its intimacy, is capable of forming arabesque-like surface patterns from the profundities of existence. 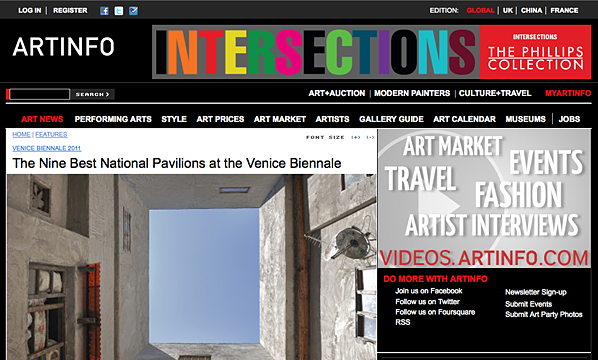 Over the weekend, the organizers of the 54th Venice Biennale announced the winner of the highly anticipated Golden Lion award for best national pavilion at the international art summit, with that coveted honor going to Germany for its moving display of work by the late performance artist and inveterate experimentalist Christoph Schlingensief. (German art star Gerhard Richter had criticized the choice of Schlingensief, calling it a "scandal" and an indication of the "decline of painting" — so the prize comes as a serious vindication). Mike Nelson's multi-chambered immersive environment re-imagines the artist's contribution to the 2003 Istanbul Biennial, the idea being to point out the link between these two historically great mercantile centers. The visitor rambles through a series of spaces on different levels of the building: a darkroom, a ramshackle bedroom, a workshop, two nearly identical arched rooms with ruined looms in them, and, of course, a bathroom replete with Turkish toilet. Although the narrative thread is obscure, it is also quite compelling. Turner Prize nominee Karla Black has created an impressive installation harmonizing abstract forms with ravishing colors that echo those of the 15th-century Palazzo Pisani in which it's housed. Black here works in such materials as Vaseline mixed with Venetian marble dust, sugar paper and eye shadow, top soil and mulch, cellophane, soap, and sand — all to ravishing effect. "Crash-Passive Interview" by Hajnal Németh consists of a multimedia installation combining, among other things, a video of opera singers singing about a car crash as well as a smashed car. But it is the galleries bathed in a blue and then magenta light, causing a sense of optical dislocation, that make this pavilion unique in the Biennale. From the runner atop an actual tank treadmill to the alternating performances by male and female gymnasts, this extraordinary pavilion by Allora & Calzadilla takes physicality to an extreme degree. The gymnasts perform routines on wooden sculptures representing economy and business-class airplane seats, suggesting the American obsession with fitness and the rigors one must go through to fly these days. In another room, a functional ATM operates inside a working pipe organ — because of course Mammon is our god and, as the tank outside reminds us, we will go to almost any length to protect our financial interests. Gigi Scaria knew it well before. Not that he would participate in the Venice Biennale but that he would do a work that would somehow reflect the workings of an elevator; an elevator has been a constituent of the metaphors that Gigi has been collecting all these years not only for making art but also for making his imaginations rich and beautiful. All the imaginations cannot be translated into a reality. Perhaps, that is possible for the contemporary artists; they could imagine anything and fabricate anything. 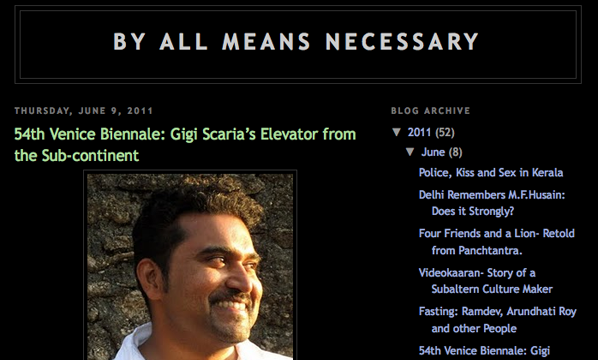 Gigi Scaria did fabricate an elevator for the Venice Biennale, 2011, in which he participated as one of the five participants. But he leaves a lot for the imaginations too as he believes that if some fabricates everything one has in his mind, the life loses its own charm. It is like as poet Satchidanandan translates a Welsh poem that says, a translation is like a kiss through a hand kerchief. Gigi believes in kisses through hand kerchiefs when he is not kissing life directly on its lips. Known for his takes on growing urbanism and the concerned knowledge field of urbanology through various mediums such as painting, sculpture, digital art and video, Gigi this time, for the Venice Biennale, has worked on a sculptural installation that includes sculpture, video and the physical and the mental participation of the viewers. His work is titled ‘Elevator from the Sub-continent’. The Elevator from the Sub-continent is fabricated by real elevator making company in Delhi. Customized as per the demands of the artist, this elevator could accommodate seven people at a time. One could call the lift by pressing the button. The door opens and you enter. Once you are in what you see on the three sides (generally you see mirrors or panels inside a lift) the virtual simulation of a parking lot, which means you have just parked your car and walked up to the lift and got inside. The door closes behind you and you press the buttons and the lift starts taking you up first. In fact the three sides are created by video projection from the backside. And as you go up (or as you get a feeling of going up) you get to see different kinds of interiors of urban homes where different realities are played out (you may remember Gigi’s video titled ‘Political Realism’ in which you see the greatest political events of the world being acted out inside two urban houses in Delhi, interestingly suggested by a moving metro on an elevator corridor). Finally you reach the top and you get a full view (bird’s eye view) of the city. You feel good. Gigi articulates his concerns over the social divides and the sense of achievement and the general sense of satisfaction through the layering and heirarchizing of the society. It is a political and economic divide and most of us choose to escape from the floors that are unpalatable. Through this virtual travel in the sub-continent elevator, Gigi speaks of the life and times of the people outside the discourse (as well as within the discourse) of the rest of the world. This is a new imposition, he feels and he identifies the every changing and expanding imposition of hierarchies clearly articulated in the urban spaces. Elevator becomes a strong metaphor to express it. Gigi is not yet forty years old. Perhaps, he is the only artist who has got real international acclaim through the sheer force of the work and the idea behind it. And there are many more years for Gigi to come up with more moving works, more persuasive works and more humane ones.